SHE GLOWS! MIMI The Cannibal Girl gets a new edition! Mondo Green Ghost Edition to be exact and she glows, sorry we get a little carried away with anything that glows, HA. 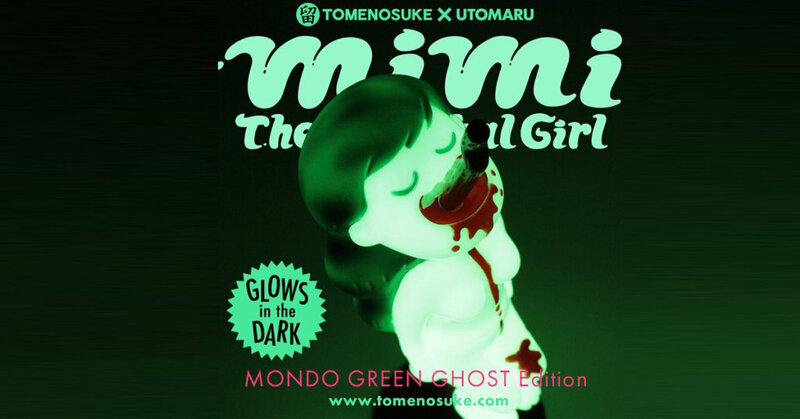 If you’ve been following us and all the versions of MIMI The Cannibal Girl released over the past few months this Mondo Green Edition has been the one edition that we’ve been on the hunt from day once since we laid eyes on MIMI back in April 2017. Check out the LIVE stream below at Dcon 2018 where you can see MIMI The Cannibal Girl” Mondo Green Edition by Utomaru x Tomenosuke and MORE on display. NOW with the added GID this could be our new favourie edition. Mondo Green · OG version is also handled slightly. http://tomenosuke.bandec-japan.com/en for more sofubi goodness.